When my oldest child, Sofi, was a toddler, she had some strange little behaviors. There were many little things that gave me concerns, but when I would bring them up with friends or doctors, they were always shrugged off. “It’s just the age,” I was told, over and over again. “Two-year-olds aren’t supposed to cooperate!” friends reassured me. But, I couldn’t shake the thought that this wasn’t on the spectrum of normal. Yet, Sofi had passed her newborn hearing screen. At 3 years old, she passed another, similar test. 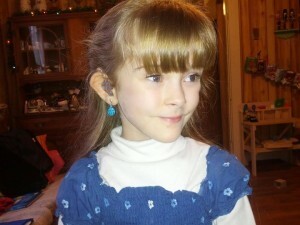 At 4.5 years old, she got a hearing aid, and her life was greatly changed. For the past many months, I’ve been watching these same strange little behaviors in my 2-year-old, Elliott. Today, we had his hearing checked, and it looks like he will likely be receiving his own hearing aid in the near future. Both of our children have a hearing loss in only their right ear. This led to the interesting symptoms I referred to earlier. It also made it harder to identify the fact that there was a problem, because both children could obviously hear. There were several symptoms that alerted us to a potential problem in our children. Speech delays — Sofi spoke very little at all until she had received some speech therapy at 2.5 years old. Elliott has a huge vocabulary, but he had a very difficult time transitioning from using one word at a time to joining words in sentences. Abnormal speech patterns — Sofi had about 50 spoken words at 2 years old, but they all sounded like “Mama,” “Dada,” or “Baba.” I was the only person who could routinely understand her, and that was with a strong use of context clues. Also, she rarely made speech-type noises, unless she actively needed something. Watching videos of her from that time period features a silent sound track, until the silence is suddenly shattered by my saying something to her. Elliott, on the other hand, has two volumes — loud and louder. At nearly 3 years old, I don’t believe I have ever heard him whisper. Neither of these is a “typical” speech pattern. Mispronouncing words — Nearly all children mispronounce at least some words, but when a child has a hearing deficit, this can be more pronounced, or it can happen in an odd pattern. For example, Elliott’s vocabulary is huge, yet his pronunciation is very limited. He says “ou” instead of “you,” “Dalter” instead of “Walter,” “apferwutely” instead of “absolutely,” “Hofi” instead of “Sofi.” Sofiya had a more typical pattern of missing several different difficult letter sounds, such as l, r, and s. While Elliott puts those letters in some words but not others, Sofi never used them before speech therapy. “Behavioral issues” — Sofi, the most easy-going child ever, simply wouldn’t do many things that I asked her to do. But, it wasn’t in a defiant way. It was more like she thought she was cooperating — only she wasn’t. Elliott is often simply unresponsive when I am talking to him — especially considering that he has three siblings who are often creating “background noise” while I am attempting to talk to him. He also doesn’t cooperate with a good amount of what I ask of him. Frequent falls — I didn’t equate this one with hearing loss until after Sofi got her hearing aid and stopped falling all of the time. When she was learning to toddle, she had an abnormal number of bumps and bruises, including a concussion at 18 months when she fell out of a chair. She was not a daredevil. Far from it, in fact! 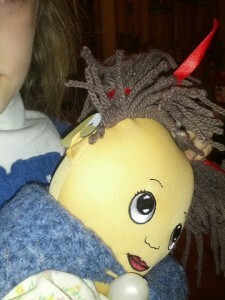 She was one of the most cautious children I have ever met. But, it seemed that she just could not stay on her feet! Even at 4 years old, when she had been walking for years, she was still just very clumsy. She didn’t have to trip over anything to tumble. When she got her hearing aid, she stopped falling so often, pretty much overnight. Now, with Elliott, we see a similar pattern. He seems to tumble over his own two feet many times a day. 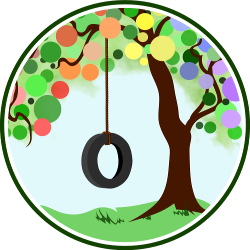 With a loss of hearing in one ear, children often have a loss of balance as well. These are all minor signs — things that were not earthshaking. When Helen Keller was a young child, the story goes, someone knocked over a pile of things behind her as she sat playing and she gave no response. This was when her parents realized she couldn’t hear anything. My children do not have a profound hearing loss like this, so their symptoms are not profound either. It took looking at all of these small signs to see that there might be a problem worth investigating — as any one of these symptoms on their own probably wouldn’t have indicated an issue. I’m very grateful that I listened to my instincts and asked our doctor for a hearing test, because finding out about the hearing loss and treating it has made such a difference in the quality of life for everyone in our family. We are all able to better support Sofi and Elliott and help them to make more sense of their world. Yes! My children’s hearing aids have affected their quality of life and their functionality so much! My daughter, who barely spoke at 2, took off with speech therapy and now has a magnificent vocabulary. The aids and the early intervention made a huge impact on her. My son has now had his aid for several weeks, and we are seeing improvements in him that we didn’t even consider when we were in the process of getting his aid. It really does make a huge difference for them.